Silver Electra is the fourth in an impressive sequence of family opera which composer Russell Hepplewhite and librettist Tim Yealland have created for English Touring Opera (the previous ones were Laika the Spacedog, Borka the Goose with no Feathers and Shackleton's Cat). Silver Electra debuted in March 2017 and I caught it at a public performance at Wilton's Music Hall on Wednesday 5 April 2017. The piece is double cast and I saw Amanda Wagg (Milly), Alison Manifold (Bindi / Amelia), Dominic Walsh (Daryl), and Henry Neill (Noah / Putnam), with an instrumental ensemble (violin, viola, piano, percussion) directed from the piano by Jack Ridley. Tim Yealland directed and Jude Munden designed (note the photographs were taken with the alternative cast). 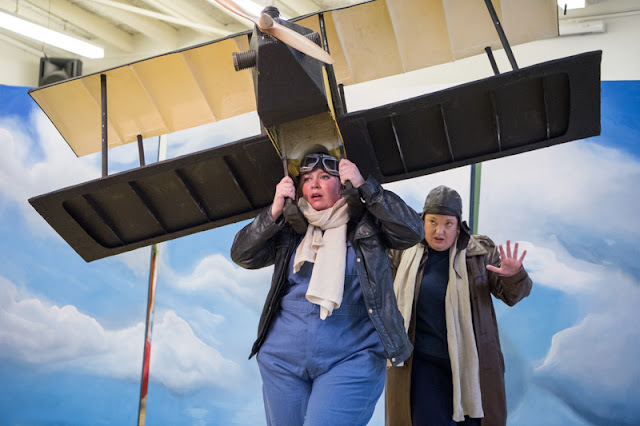 The opera deals with one of the legends surrounding the aviator Amelia Earhart (who went missing in 1937 on the final leg of her round the world flight), that she survived and lived out her life in Australia. The main section of the opera dealt with an Australian family in the Outback in the 1970s with the usual family problems, a troubled teenage son (Noah), a widowed mother in a new relationship (Bindi), a grandmother developing Alzheimers (Milly) and Bindi's new man (Daryl). In the middle of the piece Noah goes missing in the bush, and we cut to 1937 with Amelia Earhart and her round the world flight. For the dramatic finale, back in the 1970s, various clues come together linking the two plots. The opera has lots of characters (some 20) played by the four singers (complete with lightning changes of costume). Jude Munden's clever set, based on movable screens, transformed into the many locations with the aid of stage manager Ben, who almost played another character in the piece. The sets, though, did have a somewhat homespun, wobbly look though, and rather evoked period soap-operas on television, and perhaps that was the look being aimed at. 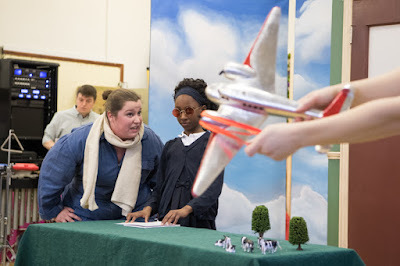 There were plenty of imaginative touches with model-making to the fore, including miniature planes, and a kookaburra, plus a larger plane which Alison Manifold (Amelia) and Amanda Wagg (Neta Snook) wore as the one showed the other how to fly, and a large sized model of the front of the fuselage of a plane complete with wings for the climactic moment when Milly (Amanda Wagg) steals a plane and rescues Noah. The plot kept moving and there were plenty of interactive moments. The cast admirably worked hard to animate an audience, with adults in the majority, less inclined to join in or answer back than an audience of school children. 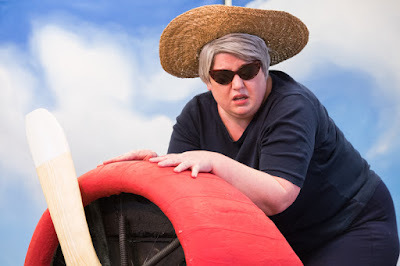 The opera (and it is an opera, being virtually fully sung), introduces a number of complex concepts including the problems of dealing with dementia in the elderly, and disaffected youth (Noah has lost his Dad, fights with his mother's new man, has joined a graffiti gang and had a brush with the law). Explanations were given without being preachy and no easy solutions were presented. Previous operas by Hepplewhite and Yealland have used an animal as the focus of the plot to find an approachable way in. Here we had a younger hero (Noah is in his late teens) and the excitement of air travel as the twin attractions. I did worry that the result might be a bit too diverse, but the sheer energy of the cast brought it off and certainly the young people around me were fully engaged. This is the fifth of Russell Hepplewhite's operas that I have seen (four for ETO and The Price for W11 Opera), the greatest number I have seen by a single contemporary composer. We had an imaginative range of music, from lovely sing-along songs to complex action pieces. There was a very fine use of percussion (with a device specially made to evoke the sound of the engine and spinning of the rotor blades). It was a score you could imagine wanting to listen to again, certainly not simply a string of popular songs. Each member of the cast played a variety of characters, and ensured that we always knew who they were as well as providing a confident and musical account of the score. At the end, there was time for questions, and we even got to see the custom built percussion instrument. As we left we each received a a free miniature model plane kit advertising the opera.